Pictures of the Herb Parsons Bridge Repair Day. 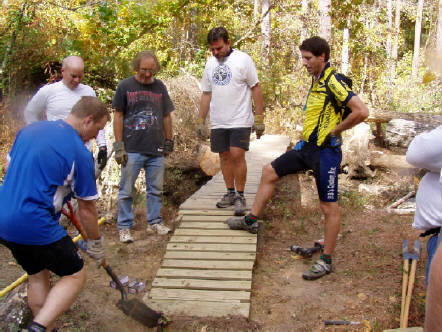 On November 5, 2005, MSTA volunteers repaired the long bridge at Herb Parsons Lake. This bridge was crushed by a fallen tree first weakened by the extremely severe storm in July 2003. The eastern 8 feet of the bridge was damaged, splintering one of the beams and dislodging the decking. An MSTA member cut the tree from the bridge several weeks before the work day. A crew was organized to jack up the undamaged structure and repair the beam and decking. The steps at the end of the bridge were removed and replaced by ramps for easier riding. Some new trail was cut for a better approach to the bridge. The pictures below show the tree damaging the bridge and the repair day activities. Thanks our volunteers who gave their time to do this repair and to TWRA for loaning MSTA their work boat to carry the tools and materials across the lake. Thanks to Lance P. for the first two pictures. This one is a close up view of the fallen tree and how the bridge was damaged. This picture shows a mountain biker crossing the tree. This longer shot shows that only about 1/4 of the bridge was damaged. The bridge is returned to a position level with the ground and the rail stanchion is removed from the shattered beam. A new board is attached to the damaged beam and a cross brace is installed. Additional work to repair the decking. Reinstalling the deck on the repaired section. All work was done with outdoor rated screws instead of nails to extend the life of the repair. Prepairing the center support. This support takes the load off of the repaired beam and reduces side sway of the bridge. Finishing touches on the ramp on the west end of the bridge. Chris I. test rides the repaired bridge. This bridge should stand for many more years.